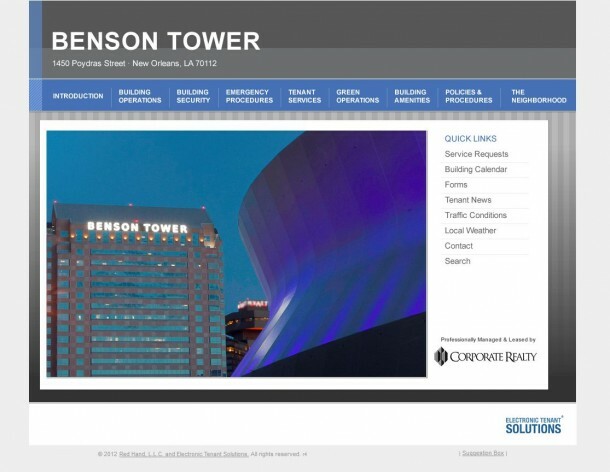 We are proud to present BensonTowerNOLA.com, the new interactive website for Benson Tower. Launched this week by the Corporate Realty property management team, the new BensonTowerNOLA.com allow us to provide better service for our clients and their tenants. Technology has given every business the power to increase productivity, instantaneously transfer data, and communicate 24/7. In the field of property management, technology has afforded us the opportunity to provide more value to clients and tenants by increasing the efficiency of building operations. We can now offer tenants a better and faster means to submit service requests, retrieve basic building information, schedule conference rooms, and access the tenant handbook and emergency procedures. Routine tasks like placing a work order or scheduling preventive maintenance can be as simple as visiting the Web. Sites can offer everything from traffic and weather information to notifications of street closings. Thanks to wireless technology, property managers and their staff can be easily accessible through iPhones and iPads. Managers can spend more time in front of their clients and less time tied to their desks. Engineers can access building automation systems anywhere at any time. Data collected from on line work orders and preventive maintenance can identify malfunctions and pinpoint inefficiencies. Paperless systems also contribute to an environmentally friendlier building. Real estate is still the relationship business it has always been. That remains one thing that technology hasn’t changed. However, technology can, when applied appropriately, make for better service, greener buildings, and increased value for our clients. Visit Corporate Realty’s Benson Tower interactive website at BensonTowerNOLA.com to see what Corporate Realty’s team of property management professionals can do for you. Blog Post by Maureen Clary, CPM and General Manager of the Benson Tower.